The office is one place where germs can spread quickly. Think about it for a moment. Every day, hundreds of people come together to work in a confined place. They stay there for eight hours or longer. During the day, many groups of people share common surfaces in the office pantry, meeting rooms and toilets. As mentioned before, studies have even shown that keyboards contain 3 to 4 times more germs than the average toilet seat. Everyone has different levels of personal hygiene practices. An American Society for Microbiology survey found that over one-third of people don’t wash their hands after using the toilet. Also, at any moment, a small percentage of those at work are falling ill or just recovering from an illness. They come into very close contact with other healthy employees because they share the same spaces and equipment: from work desks to printers and sinks to toilets. The average office is typically cleaned only twice every week. It is no wonder people catch all sorts of bugs from their colleagues at work. Proper planning and supervision of cleaning will help to reduce the potential for germs to spread in the office and promote a clean and germ-free environment where employees can go about their work routine feeling healthy and productive. Towels and mops used to wipe general areas should not be the same ones used to clean the pantry or the toilets. Just this month, hotel cleaners at five-star hotels in China were caught using toilet brushes to clean drinking cups and other crockery. Separation of equipment for general, kitchen and toilet areas is essential to prevent cross-contamination. The toilets are full of bacteria and viruses. If the same cleaning equipment is used for both restrooms and other work areas, the germs from the bathroom will spread to these general areas. Likewise for the pantry. It would be wrong practice to use the same fabrics to clean the keyboards and telephones. These cloths could be oily and stained if not washed correctly, and they could make the desks and keyboards greasy too. 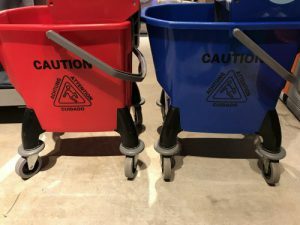 At Nimbus, we use colour coding of cleaning equipment to ensure that cleaners use the right equipment for the right areas. 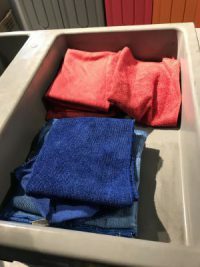 Colour coding helps to keep the cleaning equipment for toilets and the other regions separate. For example, we use red towels, mops and cloths for showers and blue ones for general workspaces. We even colour code the mop-heads for toilets on different floors, so that germs from one toilet do not spread throughout all the bathrooms. 2 different pails. Red pail for toilet use while Blue pail for common ground use. Same colour separation is used for cloth. Common spaces such as the toilets and pantry are used by multiple people every minute. It is recommended to clean these surfaces at regular times during the day to ensure that they stay fresh and pleasant for all employees to use. Of course, keeping them clean also minimises the spreading of germs. A study in 2014 found that germs from just one sick worker had spread to 50 percent of surfaces and employees in the office in less than a few hours. Mirrors and glass surfaces should be kept free from water stains and other unsightly marks. Newspapers are often seen as an effective way to keep mirrors and glass surfaces looking fresh. Conventional wisdom from the older generations is that the carbon in newspapers, mixed with the water, helps to make mirrors and glass surfaces shine, and it is used by many in the industry. However, this is a myth. It is not true. What is more, if the newspaper is not wet enough, it can even scratch your office glass. At Nimbus, we use advanced glass cleaning chemicals that are odourless, biodegradable and prevent anti-static formulation which delays dust build-up. It is recommended to remove streaks and make glass surfaces look not only freshly polished but also be germs free. Similarly, for the toilets, we recommend using Cif rather than products conventionally used at home like the toilet duck to clean porcelain, because these home products do not remove water stains as efficiently as Cif, and furthermore, Cif removes stains and makes the porcelain shine. Certain types of furniture and appliances, such as carpets, couches and cushions, remote controls, and keyboards attract an unusually high number of germs. These “germ magnets” need particular attention as they harbour harmful microbes, which increase the risk of employees catching contagious viruses and falling sick. Carpets, for example, often fall victim to spills, and they pick up dirt from shoes and clothes. A study from New York University’s Langone Medical Center showed that carpets have an average 200,000 bacteria per square inch, which is 4,000 times dirtier than toilets. In fact, rugs were found to contain bacteria that could cause a whole range of diseases: from skin infections, food poisoning, to more severe illnesses such as urinary tract infections and others that could even lead to death. At Nimbus, we use professional equipment such as Rotowash to clean carpets. It is doubly useful compared to other carpet cleaners because it has two rotating brushes instead of one, which can dig deeper and drive out dirt in the carpets. We also use a multipurpose chemical with extra-long lasting perfumed fragrance to clean high-germ surfaces such as keyboards and remote controls. Because it contains Quaternary Ammonium Cation (QAC), it acts as disinfectant so that the harmful microbes on these “germ magnets” have no chance of survival. Of course, there are many other things a company can do to prevent germs from spreading in the office. For example, HR policy that discourages employees from coming to work when they are not feeling well is essential, so that colleagues suffering from illnesses do not spread them to others. However, keeping the office clean is already more than half the battle won towards a healthy and productive workforce. Finding a professional office cleaning company, such as Nimbuswork.com, can help you handle these responsibilities so that you can focus on more important work for your business. How to get the best out of your daily/weekly/monthly service provider? Choosing a Good Service Provider : Freelancers, Cleaners on Payroll or Service Procurement?